﻿ Paterson MacDougall LLP - J. Murray Davison, Q.C. 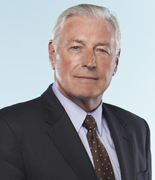 Murray Davison is a partner at Paterson, MacDougall. His practice involves the defence of municipalities, school boards, police forces and their respective employees, as well as aviation and environmental litigation. Murray is qualified as a commercial pilot. Murray has lectured at the University of Western Ontario (Faculty of Law), the Ontario Traffic Conference at the Ontario Police College and at Ontario Good Roads Association programs across Ontario. His appearances as a guest speaker include the Canadian Bar Association Annual Institute of Continuing Education, The Canadian Institute’s Annual Provincial/Municipal Government Liability Symposium, the Association of Municipalities of Ontario, the International Municipal Lawyers Association Annual Conference, the Society of Public Insurance Administrators of Ontario, the Canadian Risk and Insurance Managers Society, the International Municipal Signal Association, the International Insurance Society, the Ontario School Boards’ Insurance Exchange and numerous insurance brokers’ associations. Murray co-authored The Law of Municipal Liability in Canada and was contributing editor of Butterworth’s Municipal Liability Risk Management Newsletter.